Warts can be treated in many different ways. In this article we outline the methods, their guides and our advice. Apple cider vinegar is the most natural option. Due to our ethical ethos, we advise our clients to consider this method prior to others. Warts are a type of skin infection. They are commonly found in some individuals and can appear anywhere over the body. They appear as crusty lesions over the skin, some people have a single wart or a few within a specific area. If you are unsure whether you have a wart, please consult someone so that correct diagnosis is made. An individual can supplement their self care (see our article about the 7 healthy skin steps) and it may vanish without treatment. You can purchase topical treatments which involve the freezing of the wart. Such as Wartner this can be purchased over the counter at chemists and online, without the need for a prescription. Please note that this is not recommended for facial use as it may cause superficial or permanent scarring. If you decide to try the chemical method, please make sure that skincare is also done – in terms of applying a regular emollient to ensure safe healing and healthy skin. We always recommend the use of small amounts our 100% natural Tone and Defence Skin Oil. Due to NHS budgets there is a variation for what your GP can offer you. Some clients have experienced steroid creams being given. Steroid creams thin the skin and can work in some cases. In other cases, the patient has been given a antibiotic cream – which does not work very well unless there is a bacterial infection. Warts are caused by a viral infection of the skin. Antibiotics work on bacteria, which in rare cases occur with the wart – in this case the bacterial infection remedy will still leave a wart. Previously, GP’s could refer you to a walk in clinic at a hospital. At the clinic the nurse would use liquid nitrogen to freeze the wart. This is problematic with some skin lesions, as pits or scarring are left after treatment on the skin. Therefore some people can have another problem after treatments in this manner. Natural remedies do work! They can work slower than other methods but there are no long term side effects to health. Apple cider vinegar has many beneficial health properties. Use of apple cider vinegar has shown many of skin condition improvements being made. Be patient and do not expect very fast results (although in some cases they can respond after a few weeks). It may take a few months for them to disappear, especially if you have had them for a long time. Always ensure the skin is clean and dry before application. Apply twice daily using a cotton wool bud (swab stick). Usually after washing, morning and night. 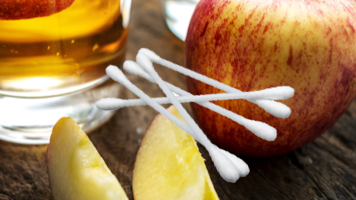 DO NOT HOLD THE COTTON WOOL BUD ON THE SKIN – SIMPLY DAB AND HYDRATE. After applying the apple cider vinegar, wait a few minutes and then apply a drop of our Tone and Defence Skin Oil to nourish the skin. Then be patient and repeat daily. In cases of using the apple cider vinegar on warts on dry skin on the feet, you can hold it on for a bit longer and file gently with an emery board prior to application. When filing, simply go over it once or twice, not thoroughly – to allow a deeper penetration into the skin. One of our psychologists at Clear Medical had a wart on her facial cheek, prior to writing her an email with advise. We verbally mentioned that apple cider vinegar works. She decided to hold a cotton wool pad drenched in apple cider vinegar on her skin whilst watching Eastenders. We saw her after this and she had scabbing due to burning her skin. Apple Cider Vinegar is very safe, please follow instructions for use above for safe, healthy and radiant skin. We carry out wart removal using Salycylic acid, which functions in the same way as apple cider vinegar for the wart removal to occur. The results are faster and improvement and healing takes less time. If you have any questions about anything discussed in this article or about the treatments mentioned, please do not hesitate to contact us. Previous post: Looking For An Eczema Treatment?